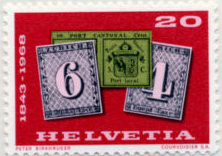 Three years later came the Swiss cantons of Zurich (1st March 1843) and Geneva (30th September 1843), where the double Geneva was the first ever bipartite stamp. I cannot afford either, (at £10,000 and £35,000 respectively) and so Swiss stamp-on-stamp commemorative issues will have to suffice. 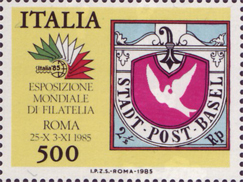 Basel was the third canton to issue stamps with the 'little Basel dove' (the first three-colour stamp) on 1st July 1845. 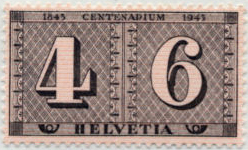 The Basel stamp has only been commemorated on a miniature sheet which is too large to include in this display [but plenty of room online, so see below]. 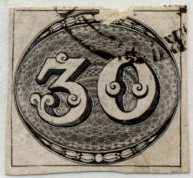 Brazil's first stamp, issued on 1st August 1843, came between the two Swiss canton issues of that year. 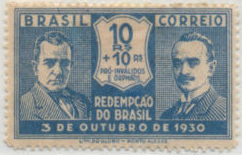 The reason for Brazil’s early entry is that J. D. Sturz, a Brazilian diplomat, witnessed the postal reforms in Europe and took the idea back to Brazil. 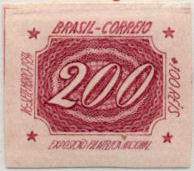 When a set of stamps is issued on the same day, as with Brazil's distinctive Bulls-Eyes in 30, 60 and 90 reis values, the convention is that the lowest denomination is the first issue. This conforms to catalogue numbering systems. 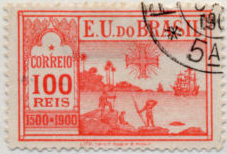 There are two possibilities for the first Brazilian charity stamp, the Scott B1 above (1934) and this 1931 issue (SG490 Sc342), intended as charity issue and commemorating the 1930 revolution but actually sold without the additional charge. The stamp was kindly provided by Roy Martin JP who bears a remarkable resemblance to Getulio Vargas on the left.